Overcoming an obstacle is easier with someone by your side. We had finally completed every single one of our exhausting exams. Meaning that we were finally able to take time off for our road trip. It was Terri who had had the wonderful idea. She had suggested it, after finding me crying in the staircase of our dorm. We weren’t even friends then, but she still took it upon herself to make me feel better. At first I accepted the plan only because I didn’t think she was serious, convinced she would forget about it. To be honest, I had forgotten. Or I had until I started receiving encouragement mail in the form of travel magazines, maps and various treats with post-it messages. She even sat silently beside me at the library when I would go study. I felt very selfish. I felt like I wasted her time. I looked at Terri as she waved at me from the rocky beach as she finished unpacking our camping gear. 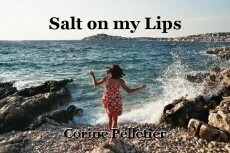 © Copyright 2019 Corine Pelletier. All rights reserved. Very captivating short story. I love your title. It drew me in as soon as I read it. yup, a splash of saline water is bound to have that effect! Thank you for reading. Thank you for reading! I appreciate the comment. Thinking as another. The key to being a writer. Always. That's the main reason I write! I love being able to explore new personalities and create new characters. Nice work and phrasing. A well rounded story with a feel good end; a great combination. --- Congratulations. I love writing that hits you in the last sentence. You just nailed it. Thank you for writing this. Well Thank You for reading. I like the idea of writing a small story which actually has a much bigger one hidden between the lines. I have read quite a few flash fiction stories, and I'm happy to say that yours was one of the better one's I've read to date. Flash Fiction may be short short fiction, but it is also one of the most difficult genres to write. I have written a few myself, so feel free to read and comment. Wow! Thank you for the compliment. Flash fiction is a style I discouvered recently with this contest, and I must say that I enjoy it very much. I will be sure to read and comment some of your stuff soon! Well done on winning! It's an unusual but very true message that more people should learn. Exquisitely written! That is so nice of you, Thank you for reading! First off I want to congratulate you on winning the contest. That gold trophy badge looks beautiful on your profile. I've never thought about flash fiction before, either reading or writing it, but I have to say it's amazing how powerful words are in a shorter format. I believe friendship can come out of nowhere to reach new heights in the instant of a second. Like in your story, crying turned to a smile in a second with the thought of a road trip, and that is the power of friendship. This story has a deep undertone, and for the word limit you had to use, a message is being spelt out, and it's a positive one. I love the message, and for the length is rather compelling. This is great, and well done on winning. It's a brilliant achievement! Thank you for taking the time to read this. This was my first flash fiction and I was surprised when I saw the results. I am truly happy I participated in this contest because it has made me realized how much I enjoy writing flash fiction. If you want to read some more of my flash fiction you can look "Short fiction collection" in my profile. I am truly happy you like this piece. Friendship can be the most amazing of things for someone in a time of need. I think it's important to remember that real friendship is not just one way and as such, our impact in a relationship can be a lot more meaningful than we assume. Great read! Hard times are definitely easier with someone by your side. I've written a couple of stories like this, but never to the same effect. Very moving and emotional, and it's a reminder that the small things in life are what matter the most. Thank you! I believe life is made up of all the small things. I don't know for you but when I'll be on my death bed its not the size of my house that will comfort me but rather the smiles of the ones around me. ( not trying to be dark or anything hehe). I 'll be sure to look at your stories soon!